The Brunt Ice Shelf is located in the Coats Land area on the coast of the Waddell Sea in Antarctica. There are massive cracks in the ice there, which are about to create an iceberg over twice the size of New York City. One of the cracks is called the Halloween Crack because it first appeared near the end of October 2016. The Halloween crack and the soon-to-be-calved iceberg are part of a bigger story in Antarctica. 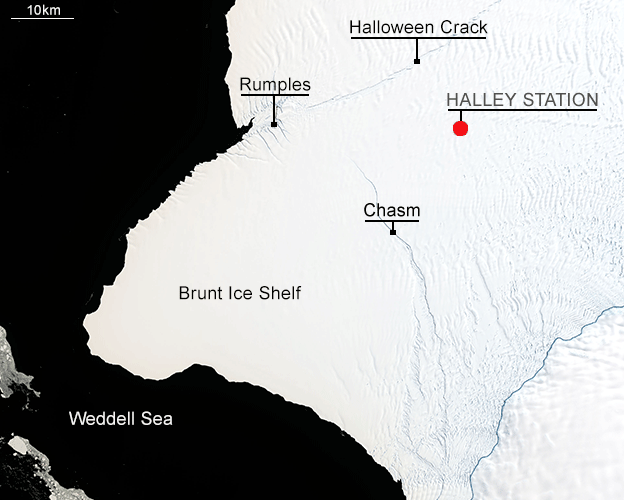 In 1956, the British set up the Halley Research Station on the Brunt Ice Shelf. It was set up there to study Earth’s atmosphere, and in 1985 scientists at Halley discovered the ozone hole. Over the years since it was established, it has been moved several times due to the threat posed by chasms and cracks in the ice. There are massive cracks in the ice there, which are about to create an iceberg over twice the size of New York City. At a planetary scale NYC is barely a blip. Non-news. It is news, considering it is the largest iceberg to break off from the Brunt Ice Shelf since 1915, which is when scientists started observing it (so probably longer). Since 1915? You can't be serious. Until the 1960s the area barely had two or three fleeting visits a year. The Brits established a base in the mid-50s, but it wasn't well positioned to observe break-offs. If you'd said late 1960s and sat-obs I wouldn't have laughed so hard. Won't be nearly as dramatic of course. This would be the largest iceberg to ever break off from the Brunt Ice Shelf, at least since we’ve been paying attention, and scientists have been observing it since 1915. Calving isn’t unusual for ice shelfs, but this level of change is unusual for the area. The iceberg will be about 1700 sq. km., depending on where the cracks meet. By Antarctic standards, that’s not huge. But as stated previously, it would be the largest we’ve seen break off from the Brunt Ice Shelf. Of deeper concern is what it could mean for the stability of the remaining shelf. The growing instability in the shelf has already meant that Halley Station has had to close down twice in recent years, and be relocated. Can someone trawl that baby to Cape Town and conveyor belt some ice into their damns and rivers? Not an iceberg yet. It only becomes one once it breaks off. Staff departed the station, leaving about 80% of the experiments they'd normally conduct through the polar night operating on automatic. BAS believes the base is far enough away to be unaffected, but it doesn't want people there just in case. Some amazing footage there. First time I've seen it.